Milk Allergy? Test yourself at home now! 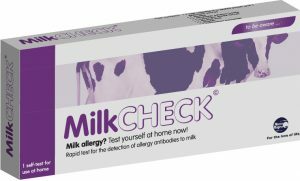 MilkCHECK is a rapid test to detect allergy antibodies to cow‘s milk protein. The test detects raised levels of IgE allergy antibodies against cow‘s milk protein and works in a similar way to hospital lab. Determining whether you have a cow‘s milk allergy is the first step to improving your quality of life by avoiding milk proteins. Each kit contains everything necessary for the test performance: an instruction leaflet, a sterile finger lancet, a blood tube, a developer solution and a test cassette. The positive result can be read within 15 minutes. The first most common food allergy in children is cows‘ milk allergy. To prevent an allergic reaction, strict avoidance of cow’s milk and cow’s milk products is essential. © 2015: ECM Medical (HK)Limited, All Rights Reserved.